I'm the Korbi. OK, so seemingly necessary, here another update. I am 24 years old and have studied, in the beginning successfully and later less so, a few semesters of chemistry. Due to a lack of an inclination for physical and theoretical anorganic chemistry and various other reasons, I was increasingly unfortunately put off by the whole setting. I jobbed for a year and pursued by own scientific studies (due to various reasons I do not wish to publicize these at this time, but at some point in time certainly) and I did volunteer work at the Tafel. Now I've been accepted by the Faculty of Pharmaceutical Sciences for the winter semester (appears to me to be more interesting than chemistry or pharmacy, perhaps check it out yourselves sometime!). There is more than enough to do (to the detriment of this site), but otherwise things are going well enough. Chemistry is pretty much my main mission in life (unfortunately not quantativly but at least qualitativly). I do value the anorganic as well as the organic chemistry, although the latter, especially in the form of preparative tasks, has become predominant. 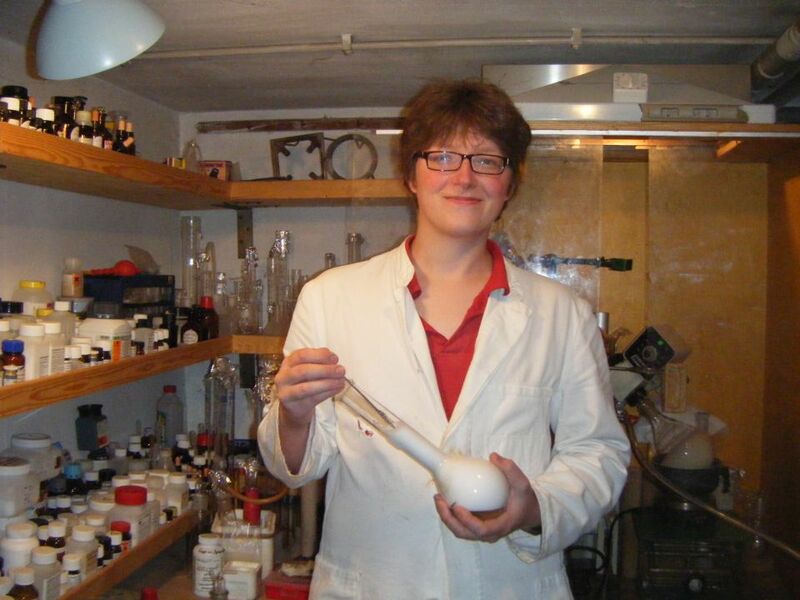 Especially of interest to me are odorous, medical and dye substances, as well as in general aromatic compounds.For more than five years I have had my own laboratory, something which was and is only possible due to the availability of an appropriate space. At this juncture I would like to express my thanks to those who made this possible and to all other patrons for their support. Aside from a rotary evaporator, I have now in the meantime built up a rather satisfactory infrastructure, even if the financing of this has been and continues to be a chronic problem. In the future I hope to at some time be able to be active in pharmaceutical research. Aside from this most interesting to me are girls (unfortunately I not for them... :-( ), books (above all chemistry, what else? ;-) ), and music (КИНО, ДДТ, АКВАРИУМ, John Coltrane, Amy Winehouse, Feinkost Paranoia, Xavier Naidoo and a whole lot more :-)! ). I am not especially athletic but I do enjoy bike riding and hiking in the summer and walking in the winter. A current photo of me in the laboratory must	eventually be taken; here perforce I driving a tractor.